First clad in the bright white, blue and orange of the Edmonton Oilers and flitting all over the ice at ludicrous speed, Wayne Gretzky piled up so many NHL records, slack jaws, hyperbolic accolades and four gleaming silver Stanley Cups, that fans and scribes alike were ready to bronze him after only nine pro seasons. But it all changed on August 9, 1988 -- the day the greatest player in league history was shipped to the greatest showplace in North America, relocating from the Northlands to La-La Land. History is going to record it, in true capitalized Hunter Thompson fashion, as The Day Everything Changed In Hockey. And it did...just not for the better. 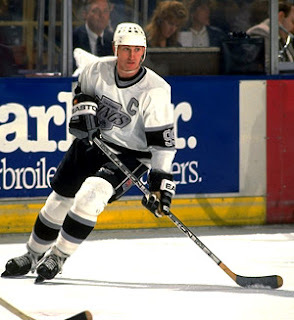 On the surface, sure, the departure of Gretzky along with wingmen/toughmen Marty McSorley and Mike Krushelnyski to Los Angeles for Jimmy Carson, Martin Gelinas, draft picks and $15 million cash did change things -- like the balance of power in the Smythe Division. But as far as this grandiose notion that it was such a seismic shift in the course of hockey history is absurd, even looking back at it from more than two decades. In fact, the whole thing kinda reeked to high heaven like a slowly expanding South Jersey landfill, and without sudden motion of tectonic plates. First, Edmonton owner Peter Pocklington was forced to make the deal...not because his relationship with Gretzky soured or the other way around, but because Pocklington had overextended himself in so many failed outside business ventures that he had to liquidate some assets in order to generate revenue. Old 99 was the biggest piece of meat and most obvious bargaining chip out there to achieve those means. 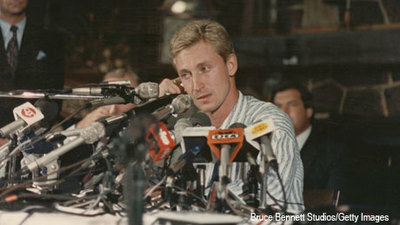 Then, the dog and pony show Pocklington insisted upon creating on the day of the trade announcement included that, according to several sources, "after the details of the trade were finalized by (Kings owner Bruce) McNall and Pocklington, one final condition had to be met: Gretzky had to call Pocklington and request a trade." This was a condition included seemingly so that the magnanimous owner could be painted publicly as someone whose hand was forced by their supposedly loyal franchise icon. And then the backlash came, with scores of Canadians so outraged they called Gretzky a traitor to his country. Let's not forget that McNall's fortune apparently came by less than legal means, and it all caught up to him years down the road which ended in a federal prison sentence and loss of things like all his pretty horsies, his vast yet totally smuggled coin collection, his post at the head of the Board of Governors, the Toronto Argonauts and of course, the Kings. Anyway, in terms of what the trade accomplished for the NHL, let's look at this from an Old Testament perspective. Gretzky begat better attendance, greater interest and a healthier bottom line for the Kings franchise, which begat things like Tom Hanks and Kurt Russell and Goldie Hawn in the front rows, which begat Disney movies, which begat teams from Disney movies coming to life, which begat interest in warm weather locales, which begat a belief that old retired Canadians and Northeasterners in their golden years would pay to see professional hockey, which begat Tampa Bay and Florida, which begat a flood of rats during a playoff run, which begat Phoenix as an alternative to Winnipeg, which begat Nashville, which begat Atlanta again, which begat plans for relocated teams to roost in Houston and Las Vegas. Of all the weird, wonderful things that have occurred throughout all levels of hockey since I became aware of the sport in 1984, the Gretzky deal has probably impacted me the least. I have only vague recollections of the day it happened, of the coverage on local and national TV, of the storm it apparently created on ESPN. I know I wasn't on vacation yet. I think I might have been at a neighbor's pool, taking time out between belly flops and Marco Polo to go flip and trade baseball cards. In early August, in the United States, in a brutally hot Summer, it was just off my radar. I had only gotten cable a couple months before, and I was bored past the point of staring at the TV as if it were a mighty tiki god and flipping through the three dozen channels on a continuous loop. I thank whatever deities there are on Mount Orrlympus that this didn't happen today. I'm dead sure it would be The Most Unbelievable Thing To Happen In The History of the Universe for about 24 hours or so, and it might just take our minds off Shark Week. It would also be total annihilation between one's temples, a pure assault of stock images, career retrospectives and half-hearted panel discussions where you can obviously tell which side the producers picked for which talking head -- all repeated on the half hour ad nauseam. If Donald P. Bellisario ever got back into the good graces of the television world, I hope he'd resurrect "Quantum Leap" for just a couple more episodes. I hope his crack writing staff could concoct a tale where Dean Stockwell gets Scott Bakula to inhabit both Pocklington and McNall's bodies and manages to reverse the deal while setting things straight with Oilers ownership. That way, we don't get things like expansion, relocation, deserts, swamps, Gretzky in St. Louis, or Glen Sather ruining the Rangers trying desperately to recapture what was never his creation in the first place. Then, I hope Sam's next leap will be the leap into the NBA office circa 1991, where he lands square on Gary Bettman and puts him in a permanent coma as the credits roll. We'd have a nice niche fourth-tier sport which remains entrenched in that niche, with levelheaded businessmen intent on preserving the integrity of the game without hazy visions of world conquest. Hell, we still might not let the Russkies come play with us. That way we could still go mad trying to decipher which Sutter brother plays where, and how many first initials are sewn on Chicago Blackhawk jerseys with so many common last names. In the end, Gretzky did get bronzed. He's standing outside what is now Rexall Place holding the Cup aloft as a tribute to the Oilers' glory years of a generation ago. But the rest of us got fleeced, being told constantly that this was a good thing for hockey, the flashpoint for greater and necessary growth. Every year on this day, we get to see that the Kingdom and the Power and the Glory is Wayne Gretzky's forever and ever as far as the sport is concerned -- despite the fact that it all happened due to forces way beyond his control. I really wonder how he feels about it. I can't imagine that in his heart of hearts he thinks that all the NHL has become -- its tangled mess of Manifest Destiny -- is really because he was who he was when the cameras rolled. The sad part is, everyone who has either covered the sport or molded the path of the league since that era claims it all happened in his name. Now the NHL is heading back to where it was, but at a more glacial pace. Atlanta begat empty seats which begat Winnipeg again, and Phoenix is one refused $25 million payment from heading back somewhere further North. So, for the 2012 Trade celebration, how about we remember an era by speaking of it in past tense? Perception is often reality, and maybe just a tiny corner of the hockey world -- a weight which he didn't ask for -- will be permanently lifted from Gretzky's shoulders if we start to close the books. We'll all be better off for it, concentrating on the future of the game instead of trying to constantly glorify the past by whitewashing the truth.